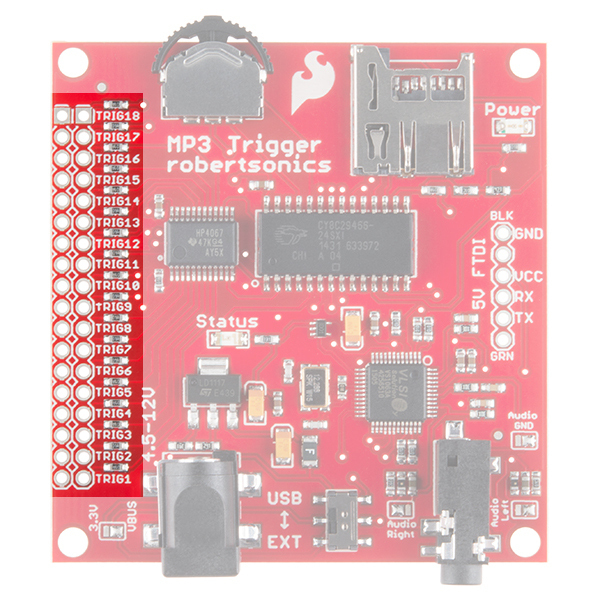 The MP3 Trigger is a versatile, low-cost, low-power embedded audio unit that plays MP3 tracks directly from a FAT32 or FAT16 formatted microSD flash card to a stereo 1/8” (3.5mm) headphone output jack, supporting up to 192kbps stereo playback. The board has 18 external input pins that when pulled to ground, trigger pre-selected MP3 tracks, and a full-duplex serial control port that provides real-time volume control as well remote triggering for up to 255 tracks. There is also an on-board navigation switch for local access and playback of all MP3 tracks on the flash card. To get started with your MP3 Trigger, you'll need a few items not included. To begin, you'll need an microSD card on which to store your .mp3 files. A simple way to power the MP3 Trigger while you're familiarizing yourself with it is to use a 9V wall adapter. 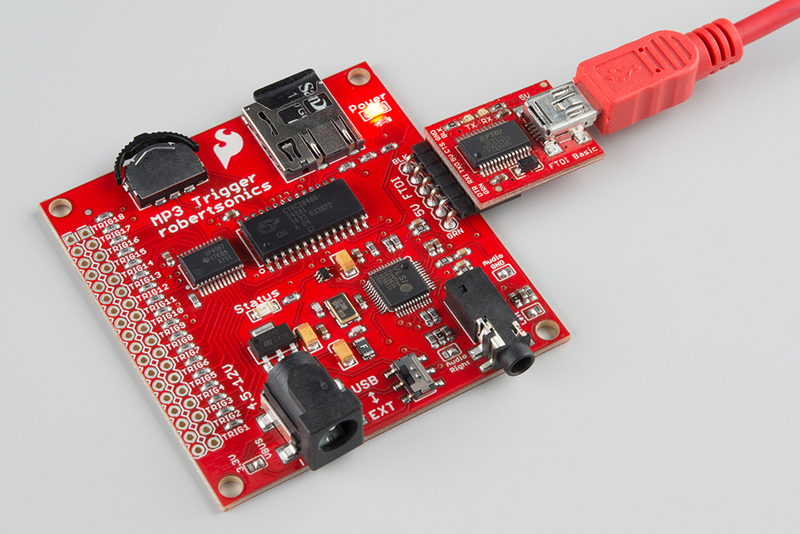 If you intend on using your MP3 Trigger with another serial device, you need an FTDI Basic or other serial connection. Last, you will need something though which to play audio. You may use headphones, a 3.5mm-to-3.5mm audio cable to connect to an external audio source, or one of our 3.5mm Audio pigtails to wire your MP3 Trigger to the output you desire. Note: The MP3 Trigger supports both SDSC (up to 2GB) and SDHC (up to 32GB) type microSD cards. How to Solder - Soldering will be necessary to attach buttons and switches to the trigger inputs. Working with Wire - You'll likely need to use some wire to attach those buttons and switches. Switch Basics - Learn about the numerous buttons and switches you can use to trigger your audio files. If you plan on using your MP3 Trigger with an Arduino or other microcontroller, you should have a good understanding of Serial Communication, Hexadecimal, ASCII, and Serial Terminals. The following will highlight the various hardware sections found on the MP3 Trigger. The MP3 Trigger is designed to be powered a few different ways. The first and most obvious power scheme is to apply external power to the barrel jack connector (5.5x2.1mm center positive). As the silkscreen next to the connector reads, you may power the MP3 Trigger through this jack with 4.5-12V DC. The solder jumper next to the barrel jack comes set to VBUS by default. Ensure that this jumper is always set to VBUS so long as you're powering the MP3 Trigger through that connector. While power is applied to the barrel jack, you may use the USB/EXT switch as an ON/OFF switch to control the power to the MP3 Trigger. It should be powered while in the EXT position. You can also solder power wires directly to the through-holes located on the backside of the board. 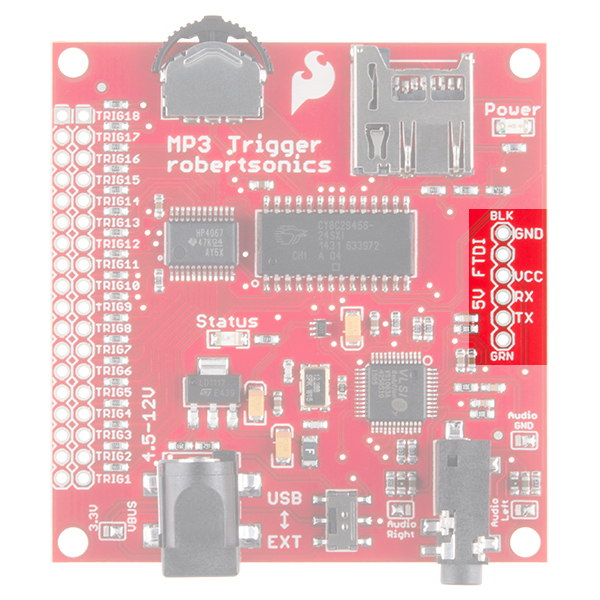 If you would like to integrate the MP3 Trigger into an existing system that uses 5V (like a USB port), you can power the MP3 Trigger through the FTDI header. You can apply the regulated power source directly to the VCC and GND pins, or you can solder some right-angle headers to the FTDI port and power with the appropriate 5V FTDI Basic Breakout. Once connected, flip the switch to the USB side to power the board. 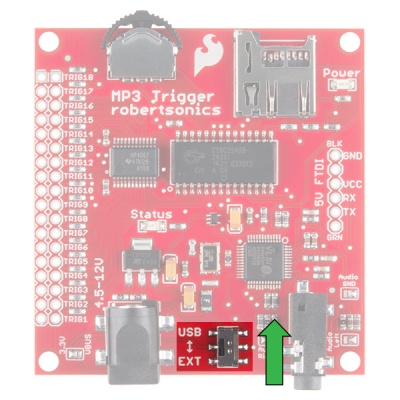 If you intend on using the MP3 Trigger in conjunction with an Arduino or other microcontroller to communicate over the UART, you will do so through this port as well. Why Use a 5V FTDI and Not a 3.3V FTDI? You may not be able to power the MP3 Trigger with a 3.3V power source via the FTDI header despite it seeming logical that you could use a 3.3V FTDI on the "5V FTDI" header. The reasoning behind this is that certain versions of the 3.3V FTDI Basic uses the FTDI IC to regulate 5V down to 3.3V. If you are using this device to power the MP3 Trigger, you may exceed the current limitation of the 3.3V FTDI, leading to a potential brown-out on your device. Thus, we recommend using a 5V FTDI Basic. 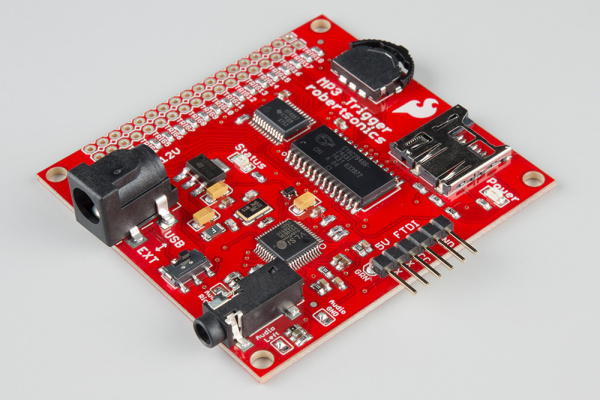 Note: SparkFun released a High-Current 3.3V FTDI Basic, known as the Beefy 3. Using this 3.3V FTDI with the MP3 Trigger is acceptable as it can provide enough current for it to operate. If you power the MP3 Trigger with a regulated 3.3V power source that is able to source enough current via FTDI header's VCC pin, you will need to clear the solder jumper and resolder it so that the 3.3V pad and center pad are connected before you can power the board. Warning: Switching the jumper to the 3.3V side will bypass the voltage regulator. You may risk damaging the microSD card and the components on the board if the voltage is higher than 3.3V or not regulated. Once connected with a regulated 3.3V power source on the FTDI header, flip the switch to the USB side to power the board. Power is indicated by the red Power LED located in the upper-right corner. The Trigger pins are what make the MP3 Trigger so easy to use. Each of the 18 triggers is broken out to a 0.1" through-hole. Next to each trigger pin is a ground pin. By shorting a trigger pin to ground, you are activating that trigger and thus playing the audio file associated with that particular trigger. More information can be found in the Using the Trigger Inputs section. The MP3 Trigger has a 1/8" (3.5mm) audio jack to connect your project to an amplifier and speakers or to headphones. You will only be able to have your MP3 Trigger configured to play audio as a line out or as headphones,** but not both at the same time**. By default, the MP3 Trigger comes configured to play over a line out to an external audio system. 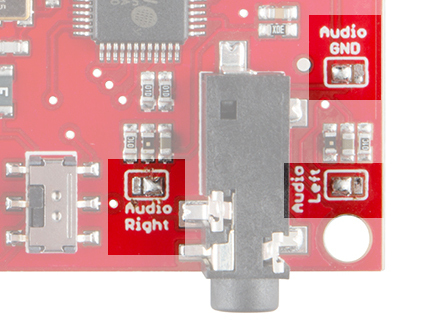 If you wish to use your MP3 Trigger with headphone instead, you'll need to clear the solder from all three audio solder jumpers and solder the center pads to the opposite pads. A solder jumper cheat sheet is conveniently printed in the silkscreen on the back of the MP3 Trigger to help you in altering the audio configuration. The navigation switch allows you to cycle through and play/stop all the tracks located on your microSD card. More information on its operation can be found in the Basic Operation Section. The microSD socket is a simple push-to-insert/push-to-remove mechanism. The MP3 Trigger supports both SDSC (up to 2GB) and SDHC (up to 32GB) type microSD cards. More information on how the microSD card initializes can be found in the Basic Operation Section. Simply drag and drop the desired MP3 files into the root directory of a FAT32 or FAT16 formatted microSD flash card using a PC. The MP3 Trigger does not support hot-swapping of the microSD Card. While this won’t damage anything, the microSD media is only initialized during power up. So whenever the card is changed or updated, be sure to power cycle the MP3 Trigger after installing the card. 1 long blink - No formatted microSD media found. 1 long blink, followed by 1 short blink - microSD media found, no MP3 files located. Constant short blinks - Hardware problem with MP3 Decoder. 3 short blinks - microSD media found, at least 1 MP3 file located. As soon as the MP3 Trigger powers up with 3 short blinks, the on-board navigation switch can be used to play all of the tracks on the card, regardless of the filenames. The trigger inputs are active low and pulled high internally. Therefore, they can be activated either by digital outputs from another microcontroller (such as an Arduino) or by a simple contact closure (switch) to ground. The inputs support voltage levels of either 5V or 3.3V. 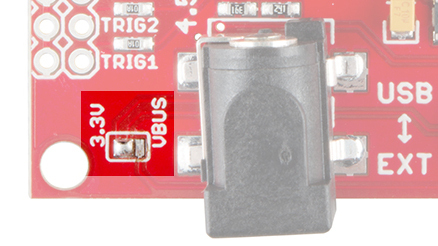 The trigger inputs are made available on the even-numbered pins of a dual row connector, and all the opposing (odd-numbered) pins are ground, making it easy to wire individual switches or contact closures directly to the MP3 Trigger board. Installing a 36-pin dual-row header allows shunt jumpers to be installed on the trigger inputs to automatically sequence and loop tracks on power-up as follows. When a triggered track reaches the end, the MP3 Trigger looks to see if any trigger inputs are active, and will automatically start another track if so. If only the same trigger is active, then that track will restart (loop). If other triggers are active, the MP3 Trigger will always start the next higher trigger track, wrapping back to 1 after 18. For example, if you wanted track 9 to play on startup, you'd jumper trigger 9. If you wanted tracks 1 through 9 to play on startup, you have to have a jumper on all nine triggers. Using the initialization file describe later in this document, triggers can be reprogrammed to start sequential or random tracks. For example, if a trigger is reprogrammed to be a random trigger, and that one trigger is shunted closed, then the MP3 Trigger will power up and continuously play tracks in a (pseudo) random order. The MP3 Trigger can be placed into Quiet Mode using the serial control port. In this mode, the trigger inputs will not start tracks but instead will cause serial messages to be sent upon activation. (See “MP3 Trigger Outgoing Message Summary” below.) This allows the trigger inputs to be decoupled from specific tracks, so that a PC or microcontroller can monitor the trigger inputs and then start any track or sequence of tracks via the serial control port. The MP3 Trigger comes with a full duplex 3.3-5V serial TTL interface that allows for control of all the MP3 tracks (up to 256) on the microSD card as well as volume, and for monitoring input trigger activity. 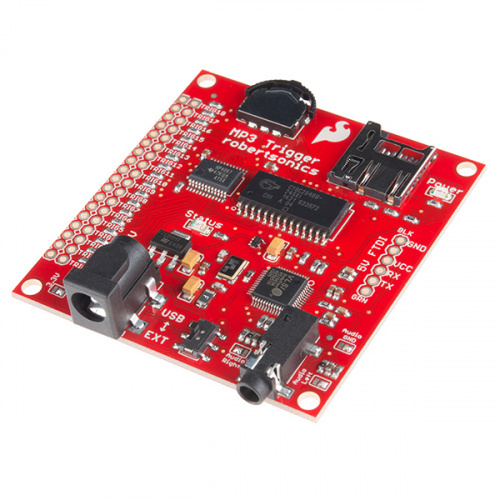 You can use an FTDI Basic or connect to any serial interface that uses the format: 8-bits, 1-start, 1-stop, no parity, flow control = none. The serial port baud rate defaults to 38.4kbps (i.e. 38400 baud), but can be changed using the initialization file. All commands to the MP3 Trigger are 1 or 2 bytes in length. 1-byte commands are upper case ASCII characters. 2-byte commands start with an ASCII character. Those starting with an upper case character use an ASCII value (‘0’–‘9’) as the second byte. (These commands can be typed on a keyboard.) 2-byte commands starting with a lower case character require a binary value (0 – 255) as the second byte. Bytes sent to the MP3 Trigger are not echoed. If echoing is required, set your terminal program to echo locally. Comments: This command performs the same function as pushing the on-board nav switch center position. If the current track is playing, it stops. If the current track is stopped, it will restart from the beginning. Comments: This command performs the same function as pushing the on-board nav switch right position. The next MP3 track in the directory will be started. Comments: This command performs the same function as pushing the on-board nav switch left position. The previous MP3 track in the directory will be started. Comments: If it exists, the track with the filename “00Nxxxx.MP3” will be started, where N is the data byte. xxxx can be any valid filename characters of any length. Comments: If it exists, the track with the filename “NNNxxxx.MP3” will be started, where NNN is the ASCII equivalent of the data byte 'n' with leading 0s. xxxx can be any valid filename characters of any length. Comments: If it exists, the nth track in the directory will be played. The total number of available tracks in the directory can be retrieved using Status Request command below. You decide to send the hex representation of the command byte and data byte. The Play command 'p' as 0x160 with data byte '1' as 0x1 are sent to the MP3 trigger. The MP3 trigger will begin playing in the order that it was saved to the microSD card. As opposed to playing the track number associated with the number 1, it will begin playing "009 SOMETHING.MP3". To play "001 SPARK.MP3", you would need to send the play command as 0x160 with data byte '3' as 0x3 since it was the 3rd track to be saved in the directory. The Trigger command plays by the track based on the file name. Using the Trigger command 'T' as 0x124 with data byte '1' as 0x61, the board will play "001 SPARK.MP3". Remember, the upper case ASCII character requires an ASCII value between '1' through '9' as the second data byte. Using the Trigger command 't' as 0x160 with data byte '1' as 0x1, the board will play "001 SPARK.MP3". As noted earlier, the lower case ASCII character requires a binary value between 0 to 255 as the second data byte. Comments: The VS1053 volume will be set to the value n. Per the VS1053 datasheet, maximum volume is 0x00, and values much above 0x40 are too low to be audible. Comments: If N = ‘0’, the MP3 Trigger will respond with a version string. If N = ‘1’, the MP3 Trigger will respond with the total number of tracks on the installed microSD card, in ASCII. Both responses will be preceded by the ‘=’ character. Comments: If N=’1’, Quiet mode is turned on. If N=’0’, Quiet mode is turned off. Default state is off. ‘X’: When the currently playing track finishes. ‘x’: When the currently playing track is cancelled by a new command. ‘E’: When a requested track doesn’t exist (error). In response to a Status Request Command, data byte = ‘0’, the MP3 Trigger sends an 18-byte version string: e.g. “=MP3 Trigger v2.50”. In response to a Status Request Command, data byte = ‘1’, the MP3 Trigger sends the number of MP3 tracks on the currently installed microSD card: e.g. “=14”. A value of 1 in a bit position indicates that the corresponding trigger input was activated. This is a sample init file for the MP3 Trigger v2, firmware version 2.40. MP3TRIGR.INI and be located in the root directory. occurrence of the '*' character is treated as the end of file by the parser. on the length of the comments that follow the first '*'. examples - which are redundant since they are all default values. first 4 MP3 files will be excluded from the random trigger function. feature does not apply to function types 5-7. You only need to include entries for triggers that are to be non-default. powers up and loops continuously through all the tracks on the card. The MP3 Trigger has a resident bootloader that allows updating the firmware directly from the microSD card, alleviating the need for a hardware programmer. Because this bootloader is in located in protected sectors of the PSoC’s flash memory, it cannot overwrite itself. The bootloader can always be run on power up, thus making it possible to recover from a bad firmware load. IMPORTANT NOTE: Use of a hardware programmer, such as the Cypress MiniProg, to program the MP3 Trigger with anything other than the bootloader image will erase the bootloader. Don’t do it! To update the MP3 Trigger firmware, copy the new firmware hex file to a FAT16 or FAT32 formatted micro-SD card and rename the file to “MP3TRIGR.HEX”. It doesn't matter if it's the only file on the microSD card or not - the bootloader will find it as long as it has this exact filename. Insert the microSD card into the MP3 Trigger with the power off. Hold down the center nav switch while turning on the power. Wait for the status LED to go solid, then power cycle the MP3 Trigger to run the new firmware. The bootloader is always entered whenever the board powers up. The first thing it does is look to see if the center nav switch is being held down. If not, it immediately vectors to the start of the firmware. Note that if you have previously loaded bad firmware, the board will simply halt or do whatever your bad code tells it to do – possibly with no activity other than the power LED. This is normal if there's no good firmware loaded. If the center nav switch is being held on power up, the bootloader searches the microSD card directory for a file named "MP3TRIGR.HEX". If there's no card installed, or the file doesn't exist on the card, it will blink the status LED very rapidly forever. If it finds and is able to open the file, it begins to program the PSoC Flash with the contents of the firmware file. The status LED will illuminate for each hex record programmed. If it successfully programs the entire file, the status LED will turn solid upon completion. You can then power cycle the MP3 Trigger and you will be running the new firmware (don't hold the nav switch down again or you will simply re-enter the bootloader. If there's a flash memory programming error (or you pull the microSD card out before it finishes, for example) the status LED will indicate a bad programming cycle by blinking briefly at about 1 Hz (This looks very different than the blinking for programming records). You need to cycle the power again holding the nav switch to re-enter the bootloader. The key is that the bootloader cannot over-write any p art of itself, no matter what's in the firmware image file. The worst thing that can happen is you load bad firmware and the board won't run. But you can always hold the nav switch down on power up and get into the bootloader to load new firmware. Thanks for reading! Here are some additional resource and tutorials for you to explore.